Epilepsy: How To Deal with Epilepsy? 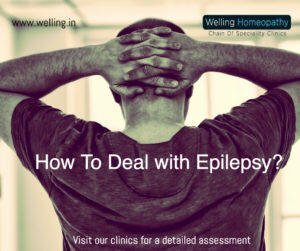 Homeopathic treatment of epilepsy at Welling Clinics involve a detailed pre-treatment analysis followed by tailor-made treatment that is specially formulated for you. The treatment not only helps in reducing the epilepsy attacks but also helps in complete cure of Epilepsy. Visit one of our clinics or chat with our doctors online for more details about our homeopathic treatment of epilepsy. Epilepsy is a condition where the nerve cell activity in the brain is disturbed. Epilepsy is a disorder in which nerve cell activity in the brain is disturbed, causing seizures or periods of unusual behavior, sensations and sometimes loss of consciousness. People with epilepsy behave differently. Some simply stare blankly for a few seconds during a seizure, while others repeatedly twitch their arms or legs. You need to have two unprovoked seizures to be diagnosed with epilepsy. All seizures need to be treated because they can be dangerous during activities such as driving or swimming. Seizures are classified as focal or generalised based on how the abnormal brain activity begins. These seizures involve a change or loss of consciousness or awareness. During a complex partial seizure, you may stare into space and not respond normally to your environment or perform repetitive movements, such as hand rubbing, chewing, swallowing or walking in circles. These seizures involve all areas of the brain. Six types of generalized seizures exist. -Absence seizures. Absence seizures often occur in children and are characterized by staring into space or subtle body movements such as eye blinking or lip smacking. They may cause a brief loss of awareness. -Tonic seizures. Tonic seizures cause stiffening of your muscles. These seizures usually affect muscles in your back, arms and legs and may cause you to fall to the ground. -Atonic seizures. Atonic seizures, also known as drop seizures, cause a loss of muscle control, which may cause you to suddenly collapse or fall down. -Clonic seizures. Clonic seizures are associated with repeated or rhythmic, jerking muscle movements. These seizures usually affect the neck, face and arms. -Myoclonic seizures. Myoclonic seizures usually appear as sudden brief jerks or twitches of your arms and legs. -Tonic-clonic seizures. Tonic-clonic seizures, previously known as grand mal seizures, are a dramatic type of epileptic seizure and can cause a loss of consciousness, body stiffening and shaking, loss of bladder control or biting off your tongue. Epilepsy most of the time has no identifiable cause. The condition may, however, be traced to various factors. Some types of epilepsy run in families. In these cases, it’s likely that there’s a genetic influence. Certain genes may also make a person more sensitive to environmental conditions that trigger seizures. Brain conditions. Brain conditions such as brain tumours orstrokes, can cause epilepsy. Stroke is a leading cause of epilepsy in adults older than age 35. Infectious diseases, such as meningitis, AIDS and viral encephalitis, can cause epilepsy. Prenatal injury. Before birth, brain damage could be caused by several factors, such as an infection in the mother, poor nutrition or oxygen deficiency. This brain damage can result in epilepsy or cerebral palsy. Epilepsy can sometimes be associated with developmental disorders, such as autism and neurofibromatosis. Seizures in childhood. High fevers in childhood can be associated with seizures. These children generally won’t develop epilepsy, although the risk is higher if they have a long seizure, other nervous system conditions or a family history of epilepsy. Having a seizure can lead to circumstances that are dangerous to yourself or others. Drowning. If you have epilepsy, you’re likely to drown while swimming or bathing. Emotional health issues. People with epilepsy are more likely to have psychological problems, especially depression, anxiety and, in extreme cases, can lead to suicide. Problems may be a result of difficulties dealing with the condition itself as well as medication side effects.Status epilepticus. This condition occurs if you’re in a continuous seizure lasting more than five minutes, or if you have frequent recurrent seizures without regaining full consciousness in between. Sufferers have an increased risk of permanent brain damage and death.Sudden unexplained death in epilepsy (SUDEP). People with epilepsy also have a small risk of sudden unexplained death. The cause is unknown, but some research shows it may occur due to heart or respiratory conditions. Treatment of choice for epilepsy is customised Homeopathy Treatment that is specially formulated for you. Your doctor will advise you about the appropriate time to stop taking medications. More than half the children with epilepsy who aren’t experiencing epilepsy symptoms can eventually discontinue medications and live a seizure-free life. Many adults also can discontinue medications after two or more years without seizures. Finding the right medication and dosage can be complex. Your doctor will consider your condition, frequency of seizures, your age and other factors when choosing which medication to prescribe. Your doctor will also review any other medications you may be taking, to ensure the anti-epileptic medications won’t interact with them. Your doctor likely will first prescribe a single medication at a relatively low dosage and may increase the dosage gradually until your seizures are well controlled. Always call your doctor before switching to a generic version of your medication or taking other prescription medications, over the counter drugs or herbal remedies. Notify your doctor immediately if you notice new or increased feelings of depression, suicidal thoughts, or unusual changes in your mood or behaviours. At least half of all people newly diagnosed with epilepsy will become seizure-free with their first medication. If anti-epileptic medications don’t provide satisfactory results, your doctor may suggest surgery or other therapies. You’ll have regular follow-up appointments with your doctor to evaluate your condition. Visit one of our clinics or chat with our doctors online for more details on our specially formulated Homeopathy treatment for Epilepsy. ← What is the Difference Between PCOS and PCOD?